Have you been thinking about adding a fence? Of course you have. You are an intelligent individual. You know that a new fence is a great investment. It not only helps improve the curb appeal of your home, but will also add privacy, security, and so much more to your property. The only tough question is qhat type of fence to choose. Okay, so maybe it really isn’t that tough of a question. When it comes to fencing, nothing beats Wood Fences. Wood fences are simply beautiful, offering an aesthetic appeal unmatched by other fences. After all, there is a reason that other styles of fencing try to mimic the look and feel of wood. Wood fences offer homeowners more customization than other types of fences. Want to stain your fence? Pick out the color you want and get to work. Want to paint your fence? Then paint it. Want to change the color of your fence? Go for it! When properly maintained, wood fences last a very, very long time. Plus, they are easy to repair. Wood fences come in so many styles that you are guaranteed to find one that matches your style. Wood fences are surprisingly affordable. Contact your local, Northern Virginia fencing company to learn more. As you can see, there are several benefits to wood fences. And perhaps the only thing easier than choosing a wood fence is choosing your fencing company. 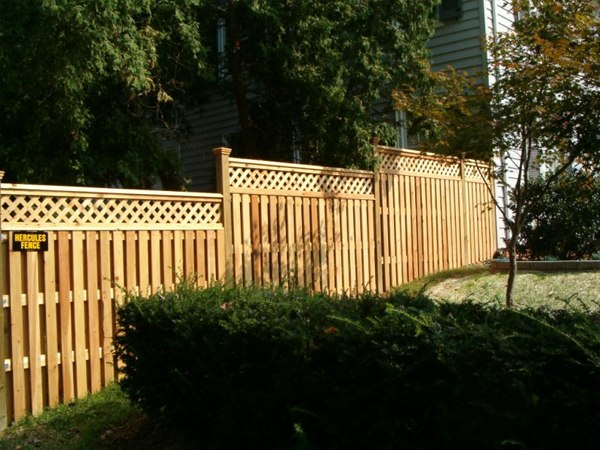 Since 1955, Hercules Fence has been providing professional service and quality installation for both commercial and residential fences throughout Northern Virginia. We pride ourselves in installing high quality fences at affordable prices. Hercules Fence is also the largest fence company based in Virginia. So why would you call anyone else? If you have any questions about The Benefits of Wood Fences, please contact Hercules Fence of Manassas, Virginia today by calling (703)551-2609 or visiting our website. Also, check out Hercules Fence of Manassas on Facebook,Twitter, Google+ and YouTube! This entry was posted on Friday, September 13th, 2013 at 4:52 pm. Both comments and pings are currently closed.